arrive At Our Office in New Delhi and After the Necessary Check in Details, We Get Introduced to Our Tour Leader. After that We Check in Our Gear and Things to Carry and Then Leave for Haridwar By Overnight Train to Reach in the Morning. Overnight in Train. on Arrival Transfer to Midway for Freshening Up and Then Leave for Jyotirmath By Car. On the Way Visit Rudra Prayag Where Mandakini and Alaknanda Rivers Meet. On Arrival At Jyotirmath, Check in Hotel. Dinner & Night Halt. early Morning At 0600 Hrs We Leave from Josh Imath for Govind ghat, Which is the Starting Point for the Trek. 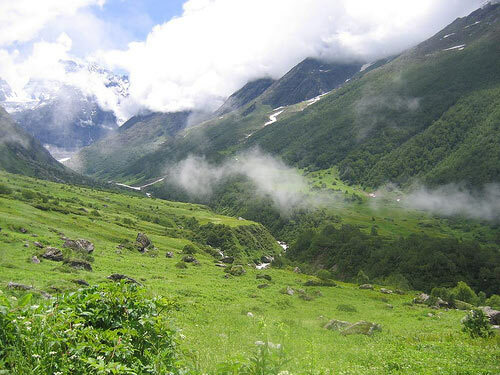 from Govind ghat There is a Gradual Ascent Along a Well - Maintained Pilgrim Trail to the Camp At Ghangaria - the Base from Where Day Walks Can Be Made Into the Valley of Flowers. Arrange Porters and Prepare for the Trek. After a Light Breakfast, 14 Km Trek Up to Ghangaria. Dinner & Night Halt At Camp. ( all Meals At Camp ). after Breakfast 4 Km Trek to Valley of Flowers (3858 M ) from Ghangaria. the Valley is An Enchanting Sight with An Impressive Array of Rare Wildflowers like Brahma Kamal, Fane Kamal with Range of Small Multicolored Flowers Make It a Delight for Travelers. the Snowclad Peaks Including Nilgiri Parbat (6474 M) Stand in Bold Relief Against the Skyline. the Valley is 10 Kms Long, 2 Kms Wide, and is Divided By the Pushpawati Stream, Into Which Several Tiny Streams and Waterfalls Merge. After Enjoying the Beauty of Valley We Come Back to Ghangaria. Dinner & Night Halt At Camp. ( Pack Lunch and Dinner). after Breakfast 6 Km Trek to Hemkund sahib (4329 M) from Ghangaria. this is Quite a Steep Climb. in the Sikh Holy Book, the Granth Sahib, the Sikh Guru Gobind Singh Recounts that in a Previous Life, He Meditated On the Shores of a Lake Surrounded By Seven Snowcapped Mountains Now Recognized By Hemkund. We Visit Lake & Gurudwara. Again 6 Km Trek Back to Ghangaria. Dinner & Night Halt At Camp. (all Meals). after Breakfast Leave for Govind ghat On the Trek of 14 Kms and Reach Govind ghat Be Afternoon and Drive Back to Jyotirmath After That. Check in Hotel On Arrival and Relax. One Can also Visit Auli in the Evening. Overnight At Hotel. ( Breakfast and Lunch ). early Morning We Leave with Packed Breakfast from Jyotirmath for Haridwar. On the Way Visit Devprayag and Rishikesh. Check in Hotel On Arrival. ( Breakfast and Dinner). after Breakfast We Visit Har Ki Pauri and Then Go to Chandi Devi By Cable Car After Lunch We Proceed to Delhi. Tour Ends with Sweet memories with Kirty Holidays.